HOT 6 Pro provides photography enthusiasts with an option of Double Amazing: a set of two rear cameras with 13 MP lens combined with a 2 MP lens which are capable of rendering images with extraordinary depth and clarity. These powerful cameras are amalgamation of different unique imaging technologies including bokeh effect, portrait mode and 9–grade beauty mode to make the user stand out in the pictures. Its front camera is no less than the rear ones. A 5M 4-in-1 camera is all what it takes to have a perfect selfie. Talking about the features of HOT 6 Pro, one needs to revise is the concepts of aesthetics and beauty altogether. With an HD 18:9 infinity display, Hot 6 Pro stands out for those users who are interested in watching videos and playing games. Big screen needs a big power booster. The 4000mAh battery provides sufficient energy for this infinity display so as to give users uninterrupted usage experience. The Qualcomm Snapdragon 425 Processor sets the base for seamless user experience of HOT 6 Pro and adds to its usage crisp. HOT 6 Pro also features an Eye Care feature that adjusts the light tone according to the environment light to reduce the affect on eyes at night and protect eyes from getting dry and painful. Pre-booking of HOT 6 Pro will be available on Daraz.pk. Get a gift box which is worth of PKR 2,000 and a PKR 1,000 voucher on every HOT 6 Pro pre-order! Order after 1st June will receive a gift box which is worth of PKR 1,000! Infinix is a premium smartphone brand from TRANSSION Holdings designed for young generations who desire to live a smart lifestyle. Launched in 2013, Infinix is committed to building cutting-edge technology and fashionably designed dynamic mobile devices to create globally-focused intelligent life experiences through a merging of fashion + technology. Through daily interactions, these intuitive products become part of a lifestyle that represents trend-setting and intelligent experiences for young people around the world. 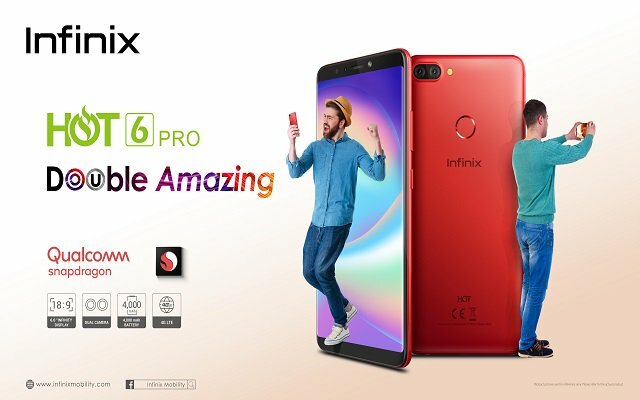 Infinix currently promotes five product lines: ZERO, NOTE, HOT, S, and SMART in a global marketplace reaching countries in Europe, Africa, Latin America, Middle East and Asia. With the brand spirit of challenging the norms, Infinix smart devices are designed specifically for young people who want to stand out, reach out and in sync with the world.